Razorfishes are an uncommonly encountered group of wrasses specialized for a life out on open sand flats. The most diverse of these are those in the genus Iniistius, which presently has 22 recognized species, some of which are exquisitely colorful. These are best recognized by their steep head profile and a notch that separates the first two dorsal fin spines from the rest of the fin. Many of these species are very poorly known, and several undescribed forms are thought to exist, one of which has just been named! Australia’s newest labrid, Iniistius opalus, is described in the latest edition of Ichthyological Research, though it’s actually been known for several decades now. 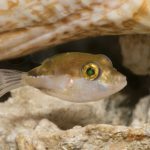 Previously, this fish had been confused with a similar looking species, the Keelhead Razorfish (Iniistius jacksonensis), now considered to be endemic to Australia’s subtropical eastern coastline. The differences between these two are best seen in the color patterning of terminal males. The most noteworthy trait are the numerous blue spots which cover the head and portions of the body, though the extent of these markings seems to vary between specimens. Some (subterminal males?) have blue spots covering the entire body, while others (terminal males?) have the spots restricted mostly to the head and belly. 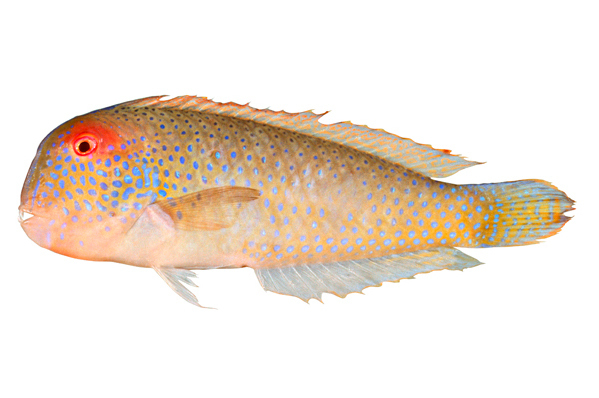 In I. jacksonensis, these spots along the belly are larger and the patterning of the head is more labyrinthine, with an oblique blue line behind the pectoral fin. Females seem to be undocumented, but are likely considerably less colorful. 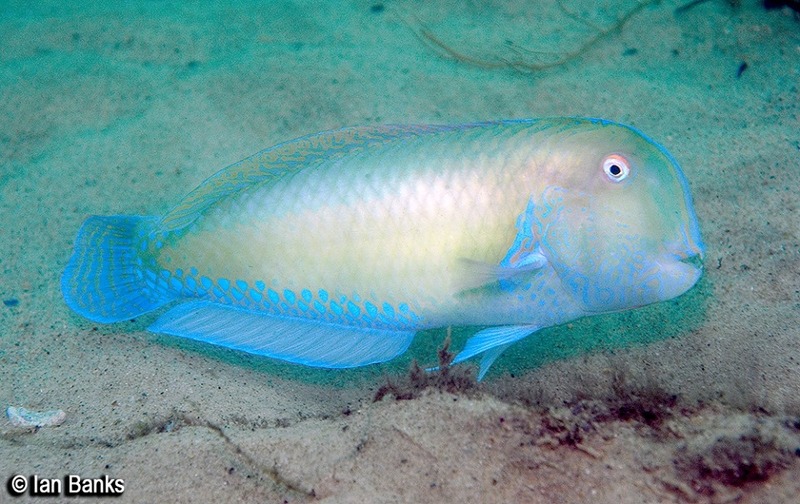 In Rudie Kuiter’s epic treatise on wrasses, he referred to I. opalus as the Blue-spotted Razorfish, but this new paper goes with the more poetic Opaline Razorfish for the common name, in reference to the reflective qualities of its blue markings. The known distribution stretches from the Montebello Islands along the Pilbara coast to the Gulf of Carpentaria, in depths ranging from just 15 meters to more than 60. 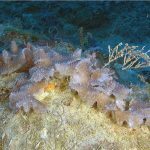 Plenty of aquarium collecting goes on in this region, so it’s quite possible that this eye-catching species may someday find itself exported. 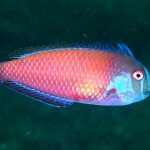 However, collectors usually avoid the sort of open sandy habitats that Iniistius specializes in, as there’s generally not much else out there in the way of colorful fishes.